Hello Everyone! My name is Heather and I blog at HangryPants.com about food, fitness and life. I am a teacher in an elementary school in a New Jersey town where people don’t pump their fists, they pump their credit cards. Everyone is fit and healthy. Well, not everyone, but you get my point. 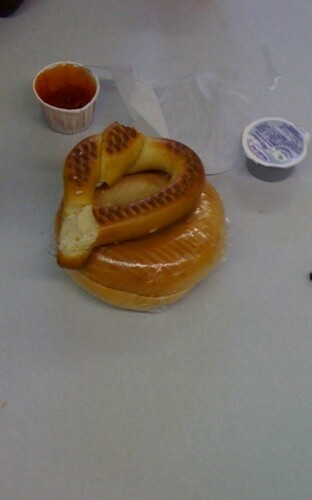 I tell you this to share that school lunch … challenges exist everywhere. Before I watched Jamie Oliver’s Food Revolution it did not occur to me that the school cafeterias had functioning kitchens. My mom packed my lunch everyday, so I never paid much attention and I assumed everything came frozen and was heated up. I’ve been making my fair share of observations in the cafeteria. Most kids do not eat a whole lot during lunch. They can’t socialize during class, so lunch is a free time with their friends. This is one criticism I have of the show; for the sake of drama they made it seem like kids refused to eat Jamie’s food and were throwing it all away, but that happens regardless of what they are eating. Yes, I see kids throw away more bananas than half eaten cookies, but both often go in the garbage. Food is the incidental part of lunch for most kids. There are always sandwiches on wheat bread available. There are usually salads (and I even saw a child buy one once). There are forks, knives and spoons (but no plates). Overall, I think it would be possible to eat a healthy and nutritious meal in this school cafeteria unless you are a vegetarian or have other dietary restrictions. 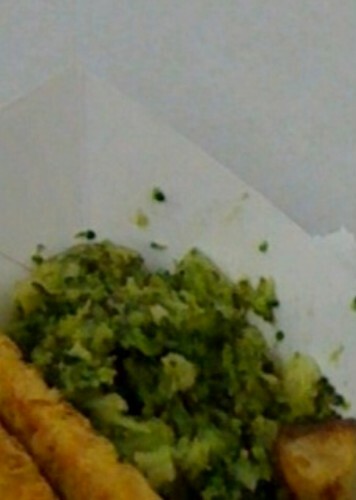 I’ve also observed negative qualities of the cafeteria, namely that there is a lot of fried and beige food. The other negative qualities of the cafeteria are behavioral – the choices the children make each day. For example, I’ve never seen a student buy one of the apples that are for sale. Purchased snacks are usually cookies, soft pretzels, bagels and ice cream. Super healthy, nutritious, unprocessed foods are available and that is great, but so is all the junk or “treats .” What do you think most 3rd – 6th graders choose to purchase? Kids with packed lunches eat fruits and vegetables. I see them munching their carrots dipped in hummus or eating leftovers from the previous night’s dinner. Home Lunch: Sushi, orange, pretzels and chocolate milk. 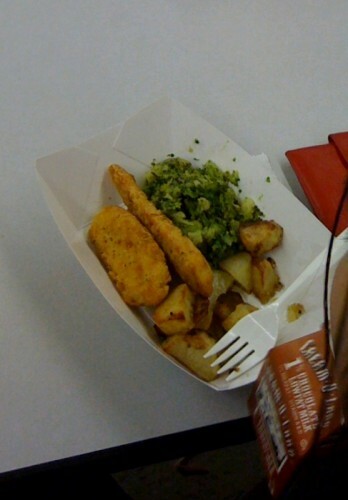 The vegetables served by the school are a shade of gray. I am not surprised they go uneaten and tossed in the garbage. Would you eat it? So what’s the solution? It’s easy to say that parents should give their children lunches from home. It would make everything easier and the stuff that kids eat would fall squarely on the shoulders of parents. But what about kids who receive free or subsidized lunch? Or kids whose parents simply cannot make lunches for whatever reason? My suggestion is simple, really. Offer better quality healthy food and limit the treats/junk with a little bit of education on the side. (1) Make the healthy stuff better: Healthy food is offered, but it is not the star of the show. Kids eat most of their packed lunches, which are usually more balanced than the school lunches. Kids will eat food they like, and presumably they like the lunches they bring to school. It’s not enough just to have a slab of vegetables on a plate. It must be good and that does require some work. (2) Limit the junk: I am all for treats, but I don’t think kids need to eat 5 cookies, a bagel and a soft pretzel everyday at lunch, especially when that’s all they are eating. When I was little we had ice cream at school once a week. I don’t think it should be taken out completely, but I also think kids could use a little help achieving moderation and balance. Instead of taunting them with the sugar laden tasty things every single day, just offer cookies once a week. I think it’s unfair to send kids to school with money for lunch and expect them to make ideal choices everyday when the other options are safer (or at least more familiar) and tastier. (3) Teach good decision making: Look, I’m a teacher and I know the last thing teachers have time for is to teach kids about nutrition and food. It only takes a little bit of time (and leading by example) to help kids make better decisions. I am not saying teach about good and bad foods – no, no, no, but rather teach about where food comes from, how it’s made, the benefits of good food, etc. This just might sink into the brains of a few children! I have a “Lunch Bunch” where kids eat with me in the classroom on a rotating basis. Kids love having lunch with their teacher and talking about what’s in their teacher’s lunch. It’s informal and social, but also informative! Heather asks: What do you think about school lunches or lunches in corporate cafeterias? Whose responsibility is it to teach children what to eat? Should schools cut out all junk food? What do you think? I love your Lunch Bunch idea. Just wondering, how many kids are in your class, how many join you for lunch and how do you work the rotation so everyone has a chance to have lunch with you? A colleague here in England has an interesting set up at his son's school. To prevent lunch money stealing and the bullying of free school lunch kids everyone has a personal swipe card, loaded with cash. The register deducts the cost of lunch and records purchases. Parents and kids can review the weeks lunches via the internet, so the can have conversations about whether he's eating sensibly and can draw parallels between when he's eating junk and feeling lousy. It works well for them. I think it's both the parents' and the schools' responsibility to teach good food choices. Kids with better food choices at home are more likely to make better foods choices in the cafeteria. But schools must provide appetizing healthy food options. I wouldn't just bite into a whole apple as a kid, but I would eat slices. It's the small things that will encourage kids to make healthier choices. Hi Heather, I am curious as to which town in NJ you are teaching at. My kids attend the Hamilton Township (Mercer County) schools and have not bought a lunch since Elementary school and even in Elementary school it was only a handful of times. The biggest complaint that they have about the lunch (other than the food all running together on a plate) is the amount of time it takes to actually buy lunch. The Middle School is so packed with kids at lunch, that they have told me that by the time lunch is almost over, some children are just getting their lunches. Mine have always preferred to pack a lunch and enjoy whatever time they can outside instead of standing in line. Both of mine will be in High School next year, and I expect I will still be packing two lunches every day. The lines in the High Schools are just as bad. So not only do we need to address what is being served, but we need to address how to move the kids through the line in an efficient manner. I love your Lunch Bunch idea by the way……. I work in school food service and appreciate hearing a teacher's perspective on lunch and nutrition education. You are so right in that it doesn't have to take a ton of class time to incorporate healthy eating lessons – just a little awareness and positive reinforcement. Your Lunch Bunch idea is fantastic! I worked at a day camp for 8 summers, and we ate lunch with the kids every day. About half of my kids ate the hot lunch, while half brought lunch from home. I particularly remember one girl, who was in my group for 2 summers in a row, always had a very healthy lunch from home, and LOVED it. She was sent in with almost always organic food, stuff like mini deli rolls, Pirate's Booty, homemade soups, leftovers from dinner, and on a rare occasion, an organic company's version of a Lunchable. Let me tell you, that kid ate everything she was sent with every day, never complained, and in fact told the other kids about why the food she was eating was healthier, and how much she enjoyed it. How old was she? 4 and 5 years old the summers I had her. I think she really is an example of how eating healthy at home from a very young age is successful and transfers to the school/camp environment. The hot lunches, which I myself ate alot of the time, were very small portions and not very healthy, even for the young kids, and I remember when I was an older camper myself there, I brought alot of snacks from home to supplement my lunch. While this was a fairly expensive camp, there were many kids who won free tuition to the camp, and therefore, a free hot lunch. Alot of these kids went hungry for the rest of the day because the lunches were not satisfying in both quantity and nutritional quality. It seems like such simple suggestions in this guest blog, ones I've read and heard many times before, but its always the simple changes that seem the hardest to convince people to make. Muchadoaboutnothing: Hi! 22 kids. They signed up if they were interested. I kept track so that I knew everyone had a chance before people came a second time. Some kids were really into it, and others would rather eat with their friends in the cafeteria. I sent out "invitations" and everything. I usually did five or six kids at a time. Tracey's Life: I would rather not say the town here, but feel free to email me at hangrypants@gmail.com and we can chat! What is the fist pumping thing about? I'm not getting the reference. You mean the people in your town are not politically/socially active? Kids who buy lunches at our school are required (?) to use a swipe card for their meal purchases (via lunchmoney.com). Parents have the ability to restrict/limit the snacks and types of food they can purchase. I think as a society, we need to teach our children to live a healthier lifestyle. It is not just the parent's responsibility to teach their child about eating healthy, for they only have their children for a few short hours of the day during the school year. It also isnt just the teacher's responsibility to teach children about a healthy lifestyle, for we only have so much time to meet the requirements set forth for our curriculum. The media shouldnt have to take all of the responsibility either, for they dont even meet our children. We all need to pull together to help our children learn a healthy lifestyle. As for treats in cafeterias, in grade school we only got icecream on Fridays, and only if we had eaten a good amount of our lunch. In highschool we had the option to buy ice-cream everyday, but it wasnt offered out in the open. The ice-cream was at the spirit store, which meant that you had to wait in the lunch line again just to get to it and if you remembered on your first round through the line, you were luck to get some beofore the line moved again. Now it is not to say that there wasnt any juck in the vending machines, becuase there was. This is where most kids got their lunch of chips and candybars with a soda. I thankfully was able to pack my lunch everyday that contained at least one fruit a veggie and then some protien, at my mothers request (I have trouble eating meat, but I'm not a vegaterian). I think a great way to help children learn a healthy lifestyle is to give them opportunities to expand. Schools should try things like school gardens, learn new games that keep kids active, ways to find different things to do instead of sitting on the computer all day or in front of the tv. We have an obligation as a society to help our children learn to live a healthy lifestyle. Here is a great PowerPoint presentation about what's being done nutritionally in the Chesterfield County, VA School District. That's a lot of questions. I'm just going to focus on the last couple. As for whose responsibility it is, well, if the schools take responsibility for teaching health, why wouldn't they teach nutrition? Aren't health & nutrition are found in the science books in most grades? Kids aren't stupid. In 4th grade my daughter said, "They make us study the food pyramid but they don't give us vegetables except white potatoes with hot lunch." Parents and schools should be partners sending the same message but for too many kids, they are getting mixed messages (or worse, the message that neither one really cares about the quality of food they eat). Why should schools sell or provide ice cream at all, even once a week? As a parent, I work hard to provide my child with a healthy diet, teach them about making good choices, and about being savvy consumers. The school constantly undermines us as parents. Our kids get candy for being quiet, turning in homework, lining up quickly. They ask the PTO to buy cookies to reward children for completing NCLB testing (they test daily for TWO WEEKS so TEN cookies per kid!) and the teachers pout when parents offer instead to send in cheese sticks or fruit slices ("too messy! ", "not enough incentive!"). My kids are inundated with sugar every time a classmate has a birthday and every holiday. If they go through a month without being sent to the office they receive a party with donuts or cookies or popsicles. They earn "money" for certain classroom activities which they can use to purchase items that include cans of soda and king size candy bars. Why on earth would my kids need cookies or ice cream in the lunch room when sugary sweets are so readily available most days in the classroom? It doesn't stop when the school bell rings… the adults running other activities my kids attend also contribute to the problem. Because the volume was so overwhelming, I still have Valentine's candy sitting in my kitchen from school, children's choir, and church (I made them throw away all the Halloween and Christmas candy earlier or it would probably still be sitting there too). For every classroom teacher who thinks she is being kind by giving kids "just a little treat", I guarantee you there are 2 or 3 or more adults in those kids' lives doing the same thing. It used to exhaust me trying to keep track of what my kids were eating and arguing about throwing it out, but it's so commonplace now they don't even bother to eat it. They just bring home their pocketfuls of loot and dump them in a cookie jar and (thankfully) mostly ignore it. It's insanity and it's a bigger problem than just the lunchroom. Mrs. Q, you are in an elementary school, right? Does the cafeteria sell additional items, like cookies, chips and such? I work in an elementary school. The only a la carte item that students can buy is milk – either an extra milk to go with the meal, or a milk to go with a lunch from home. I really had not considered that elementary level schools might be selling individual items rather than the complete meals. 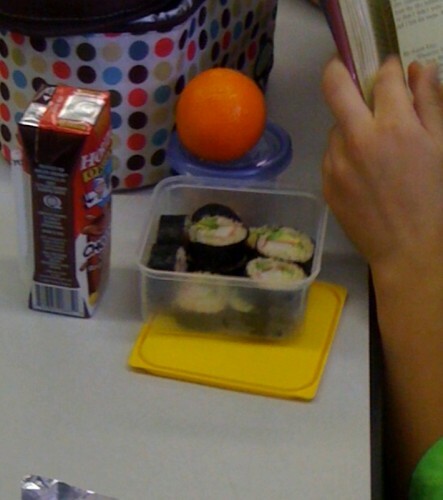 people send their kids to school with sushi for lunch? wow. I had a balogna sandwich (which I don't think it much healthier than school lunches). One thing to note about the serving of fresh fruit that came to my attention when my first child was in elementary school in Maryland. Many of the children have loose or NO teeth in some part of their mouth as they are in th eprocess of losing their baby teeth. So biting into apples becomes less appealing. And oranges take a long time to peel…not so great when your whole lunch period is 20 minutes long. Preparing the fruit might help. 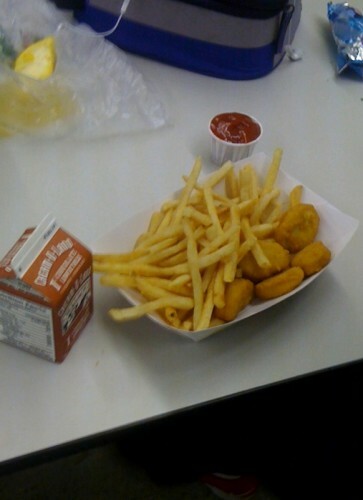 ~Cindy H.
In my school, it bothers me that kids are allowed TWO snacks with the purchase of a lunch. 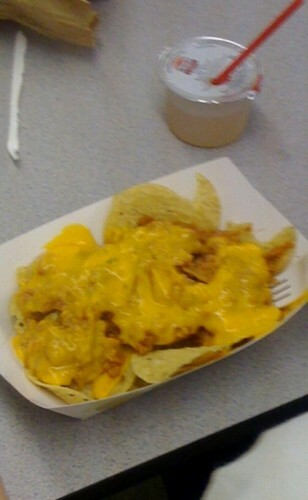 Kids who get free lunch still bring in the $2 for an ice cream and a bag of chips. Most of them just throw the lunch out and eat the snacks for lunch. I asked the lady who rings up the lunches, if that was policy about two snacks per lunch, and she said yes and didn't even give it a second thought. It also bothers me that the kids have to ASK for the vegetable of the day, or else it doesn't go on their tray. The menu that gets sent home claims most of the meals are "balanced choices" meals, which I feel is very deceiving. The salads they do have available are filled with iceberg lettuce, cheese, four tomato pieces and a few pieces of cucumber mixed in. That's not a nutritious salad to me. On the rare occasion that there's an orange or clementine as the fruit, the kids LOVE them. They're kid-sized and yummy. They'd much rather eat those than the overcooked green beans from a can. Also, I agree with Heather that kids don't eat a lot at lunch because they are too busy talking, or rushing to get outside for recess. It is important we teach kids to make healthy choices, and it starts in the cafeteria. We teach them math, reading, how to behave appropriately, etc, so why not teach them about the food they eat? There should be a limit on snacks, as used for a treat, not an everyday lunch component. It's the parents' responsibility to teach their children what food is and what food does for their bodies and why their bodies need good foods. It'd be nice if teachers tried to give that message to children too, but the teachers are there to teach curriculum for a paycheck. It's not teachers' responsibility to raise children. I've always wondered "How can school cafeteria food be FOOD if lunches cost so little?" I don't think schools should have serve any junk food or even have candy or soda machines, because it's out of the parents' sight/control and it's too tempting to kids who have some allowance money in their pockets. And school cafeterias should stop serving dog food to children. But it's all about money in the end, if ALL parents are all willing to pay $6+ a school lunch, maybe cafeteria food will improve. Hi, I just found your blog as just posted a guest blogger on my blog about the Time for Lunch campaign. Please check it out and let me know what you think about the rest of my blog. I had packed my daughter healthy lunches every day until one day I forgot and she had to eat in the school cafeteria. Needless to say, she was intrigued by the prospect of eating chicken "nuggets" and cheese pizza, both are items she rarely gets at home. She soon started to ignore her lunches and eat solely from the cafeteria. Well, after 2 months of doing so she has put on weight in her midsection. She is only 8 and has had to let the waistband out in her adjustable jeans. She complained about this and I pointed out that healthy eating is a choice,and that she had no such issues when eating home lunches.I am pleased to say that recently she is back to eating the healthy lunches I provide. Sometimes kids need to experience the consequences themselves for them to make the right choice. My mother's school doesn't have a cafeteria, because it is in a poor area and the school buildings are rented. Also, the school is poor, because they offer low fees so that the kids can keep going to school, so don't have enough money to fund a cafe. The kids have to bring their own food and if they don't bring anything, they have nothing to eat. often they don't bring very healthy foods either, eating noodles out of packets without cooking them and only eating junk food their parents buy. They always see my mum's lunches and wish they had something similar, but it's hard cos their parents either don't care (truly), don't have the time or don't have the money (although one would think it more cost effective to buy healthy food in bulk than a whole lot of junk). It's hard, sometimes. I agree that parts of Food Revolution were clearly dramatized for TV! However I do agree with the underlying message, which your posts just highlights for me. It's good to see the "good" in cafeteria lunches, but there needs to be more good! I am an Education EC-6 major and I'm about to start my student teaching semester in the fall… The school I will be student teaching at has great school lunches because they don't even offer the junk food. Students can not be tempted to choose junk food if it isn't there to tempt them. GET RID OF IT!!! Since I moved from Ohio to Ontario, my kids lunches are always packed by me. School lunches were a cheap and easy alternative in Ohio. That alternative isn't available here and my kids are healthier for it. I can afford to feed them nutritious foods, though, and I know many families in the states and in Canada, too, cannot. Healthful foods should be taught in the schools and at home. Here, starting in JK (junior kindergarten) the kids are taught to distinguish between "sometimes" (not so healthy) foods and "healthy" foods. I go a step further and use the term "rarely" for many "foods" like candy or pop which have no/negligible nutritional value but lots of calories, sugar, and/or fat. Often children and even the parents of those children get their nutrition educations from television commercials and highly processed foods' marketing. Wasn't it Fruit Loops in the states that had on its box the statement that "kids who eat fruit loops for breakfast have 25% better attention" or some such nonsense. They failed to add the qualifier that they had better attention than those who ate NOTHING. People are often too busy, too distracted, too focused on everything else to stop and think about what it is they are putting into their own and their kids' bodies. We're hungry. We eat. If the greatest information we have about the foods we eat comes from advertising … we're eating crap. Government food guidelines in the states and in Canada are arguably flawed. There's no argument that the less processed a food is, the more nutritious it is. However, what's supplied to schools is highly processed. Compare the nutrition information on a box of frozen fish sticks to a frozen pack of just fish. The differences are somewhat astounding. I think that most people don't think that much about what they're eating or feeding to their kids. Thinking 'fish is good for you' they feed them fish sticks because they contain fish and they're quick. Yet steaming a fresh or frozen fillet with a bit of dill weed on top takes half the time and provides far more good nutrition and none of the saturated fats, preservatives, or added sugars that the fish sticks contain. There's an old saying "you don't get something for nothing". Apply that to "free lunch". Sure the government will feed you…the cheapest crap they can!!! I love the Lunch Bunch idea!! =D I'd like to teach to adults, but if I ever end up teaching to children in a school, I'd love to do something similar =) It's a great idea! !